These earrings made from Herkimer diamonds and recycled vinyl beads are music to your ears. Who said life can't be all sunshine and rainbows? 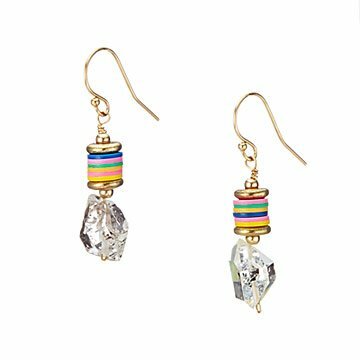 Crafted from shiny Herkimer diamonds and multicolored beads made from recycled vinyl records, wearing these earrings is the equivalent of singing your favorite song with the windows rolled down. Use 'em to jazz up an everyday outfit, or any time you want to bring a little extra color to your world. Handmade by Natalie Jacob in Brooklyn, New York. Natalie Jacob is a Brooklyn-based designer and artist that is native to the area. As the owner and designer of her jewelry company, she is an alum from MICA, (The Maryland Institute College of Art) in Baltimore and the noteworthy fame school, LaGuardia HS of Music and Art in NYC. In her previous life, Natalie was (and still is!) a classically trained artist, having even had her work featured at the Society of Illustrators in Manhattan. With such a creative background, Natalie takes these fine art influences in her jewelry work, her main artistic medium, today.